Itnuveth is a new Viking pagan black metal band from Barcelona, Spain. This project was formed in the winter of 2013 by Volundr (guitars, bass – also on Svipdagr) and Lianne Krossburner (vocals – also on Edenkaiser). Totally influenced by the biggest names of this music style, the band started working on its debut album “The Way of the Berserker“, which was released by the Spanish label Xtreem Music on October 8, 2014. While Itnuveth name among their influences bands like Windir, Moonorrow, Thyrfing, Kampfar, etc, the truth is that their music is quite different from the aforementioned bands. They have a quite personal sound and I could describe them as a mixture of epic raw old school black metal with classic heavy metal guitars. Unlike most band of the genre, Itnuveth use only the basic metal instruments, without any synths or traditional instruments. ”The Way of the Berserker” is a short album, including 9 songs with a total duration of 35 minutes. Apart from the atmospheric intro and outro, all other songs move in the same Viking pagan black metal style, changing from mid to fast tempo. There is an old school echo-distortion in their sound and this is something that helps them blend their black metal nature, with the melodic heavy metal guitars. Lianne’s vocals are ferocious black metal screams and you could never tell they come from a female singer. Volundr seems to be a quite skilled guitarist, with many technical and melodic solos, behind the band’s raw sound. I find this experiment of Itnuveth interesting, however they still need work in order to present something more solid. All the lyrics are written by Lianne in English, dealing with epic themes and Viking mythology. 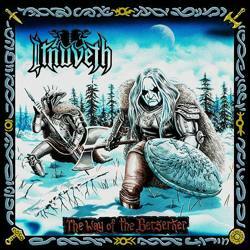 “The Way of the Berserker” is a simple, honest album, with a dark epic heavy atmosphere. If you like a synth-free old-school version of Viking pagan black metal, then you better check them. Itnuveth are just at their first steps and I find it very important that they already have a personal sound. Of course I believe that their sound can get better and their compositions need more work, in order to offer us something even more distinctive. ”The Way of the Berserker” is released via Xtreem Music in a standard jewel-case CD edition with an 8-page booklet including all the lyrics. Album artwork is by Jose Antonio Vives, matching perfectly with the band’s music. You can visit their official Facebook profile below for more info, or listen to the complete album in their label’s Bandcamp page.